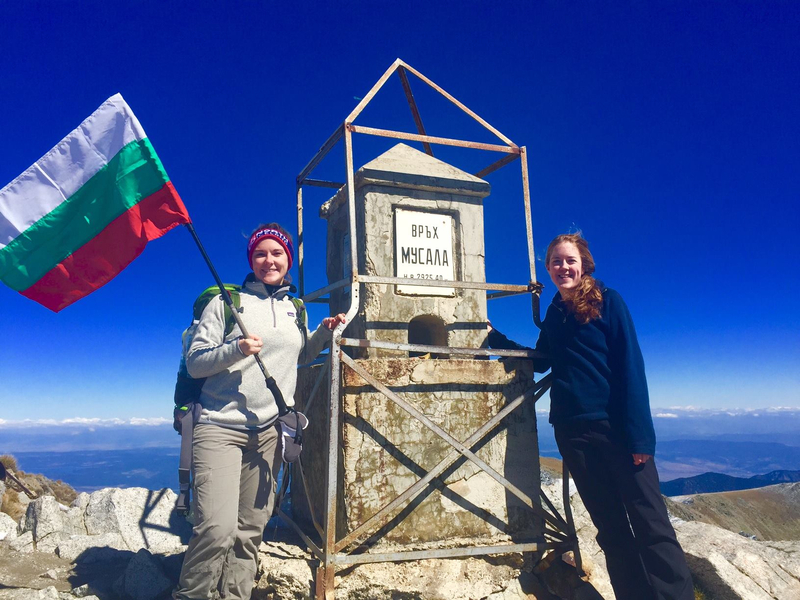 This month, the Fulbridge blog returns to its spotlights on Fulbrighters around the word with Anna Hernick, who spent two years as an ETA grantee in Bulgaria. The interview was conducted during Anna’s second grant year by Samantha Steiner, 2017 ETA in Argentina, and lightly edited for clarity by Lisa Gagnon, a 2017-2018 ETA in Latvia. Bulgaria is a place that’s been influenced by many cultures yet has its own unique and wonderful cultural identity. Personally, I’m fascinated by history, and here in Bulgaria I walk past Roman ruins every day on my way to work! The combination of pride in tradition and rapidly advancing modernity is unlike any other place I’ve been. I studied French and Arabic at Georgetown, and had the chance to study abroad in Jordan. 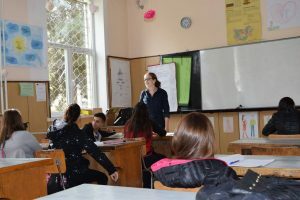 I’d spent a lot of time studying Western Europe and the Middle East, but Eastern Europe is a vital crossroads that is often downplayed in American education. As someone interested in international development, I wanted to see the realities of life in a country that went from communism to membership in the European Union in 17 years. I also wanted to learn a Slavic language. So, a variety of factors went into my decision to choose Bulgaria, but I’m certainly glad now that I did. Students from the English speech and debate team at my first host school. Their English skills are amazing and they made me feel so welcome when I first arrived here. How is Bulgaria different from the U.S.? For my second grant year, I’m living in Plovdiv, Bulgaria’s second largest city. Last year I lived in a provincial capital called Pazardzhik. I love that in both cities it’s possible to walk everywhere you’d need to go. Even though there’s a lot of beautiful, untouched nature in Bulgaria, cities and towns are built compactly around a city center. The Bulgarian language is written in the Cyrillic alphabet, which takes some time to learn. Bulgarian food is much fresher and vegetable-heavy than most U.S. meals: salads all year round, abundant locally made cheese and yogurt, and sweet & savory pastries for snacks. There’s also coffee everywhere, even in vending machines on the street, which is great for tired teachers. Lastly, Bulgarians stop to appreciate life: people celebrate their birthday and their “name day” (the Orthodox Christian saint’s day for your name), there are many public holidays and Bulgarian even has a word- ailyak- for that relaxing feeling of sitting around with good friends. Could you describe your experience navigating issues of race, gender, or sexuality in Bulgaria? Even as a white, blonde female, I’ve had some very interesting conversations around nationality and ethnicity. I use my own background as a starting point: I’m 100% American but my great-grandparents came from Ireland and Ukraine. On the other hand, many Bulgarian families have been in Bulgaria for generations. Bulgaria is much smaller than America and doesn’t build its cultural identity around immigration the same way the U.S. does. Also, Bulgarian Christians who live alongside Muslim families are usually proud of their peaceful coexistence, which reminds me of my own experiences growing up in a religiously diverse town near Atlanta, Georgia. This year, I work with a lot of students from Turkish and Roma families and it’s given me a lot to process with regards to issues of discrimination. Bulgarian friends have helped me to see the parallels between issues here and back in the U.S. In the morning, I study Bulgarian and plan my lessons. Once a week, I have a one-on-one Bulgarian lesson with one of our amazing language teachers from in-country orientation. This year, I’m working for the Trust for Social Achievement, a non-profit that aims to end the cycle of poverty in disadvantaged communities. We run after school English classes, so my teaching happens in the afternoon and evening. Most days, I walk to Plovdiv’s train station around noon and take a 20-minute train ride to a nearby town. There, I work with a group of students at a technical high school and a group of students from the local Roma neighborhood. All my students are aged 12-20. After teaching for a few hours, I take the train back to the city and prepare for an online class. I teach a group of advanced English students from different villages all across Bulgaria. We use a customized online platform that’s similar to Google Hangouts but with a ‘whiteboard’ where we can write and I can share readings and multimedia like video clips. We are able to take advantage of Bulgaria’s very fast and very affordable wireless internet. I finish online teaching by 7:45 pm, which is a normal Bulgarian dinner time. I cook at home or meet friends at a restaurant for dinner. Most weeks I’m also spending time on secondary projects with nonprofits in Plovdiv and other Fulbrighters. I also try to fit in running, which gets plenty of curious looks on the street, or other exercise a few times per week. A typical classroom setup in Bulgaria with large desks in straight lines. I help Plovdiv-based non-profits with English language writing and editing, and I meet up with Bulgarians and foreigners who work on issues related to multiculturalism and education. These are great ways to connect people beyond my school community. Occasionally, I meet with some more advanced students one on one and adults who want to practice their English. Last year I worked at a specialized public school for foreign languages, and now I get to help some former students who are now applying to universities. We aren’t allowed to be paid for any additional work during Fulbright, but this informal tutoring feels much more like getting coffee with a friend than extra work! There are always events happening in Plovdiv, from inexpensive concerts to language meetups. I’ve made friends with Bulgarians much the same way I would make friends at home, and that’s led to hiking trips, family dinners and a lot of great experiences. The language barrier is real. Many Bulgarians, especially the younger generations, speak some English, so traveling here as a tourist is no problem. However, it’s different when you need to pay your electricity bill in person, go to the doctor, or locate some specific item to repair your broken faucet. I’ve had to redefine “independence” for myself. Bulgarians are incredibly helpful, and asking someone for help with something doesn’t diminish my ability to work and live in a foreign country. I use Bulgarian to communicate with many of my colleagues this year, but my vocabulary doesn’t extend to situations like emergency dental work. One time I had to go to the dentist on a Sunday, but luckily this particular dentist spoke English! Without a doubt, the people here are the biggest highlight. From Bulgarian friends to coworkers, students and fellow Fulbrighters, I’ve met many extraordinary people in the past two years. Bulgarians are community-oriented and devote a lot of time to relationships with family and friends. The history and natural beauty is also a highlight. Plovdiv, where I live, is the oldest continuously inhabited city in Europe. I’ve come to love hiking and exploring old fortresses and churches. Over time, I’ve learned a lot of Bulgarian, which is rewarding when I remember how hard it was in the beginning. It’s an exciting time to be in Bulgaria; there are a lot of energetic young Bulgarians pursuing meaningful projects despite financial and logistical barriers. There’s a great energy to places like Plovdiv, which are welcoming Bulgarians returning from abroad and immigrants from around the world. I also feel appreciated for my work both day-to-day in teaching English, and in the larger goal of trying to close some of the educational gaps that exist here. 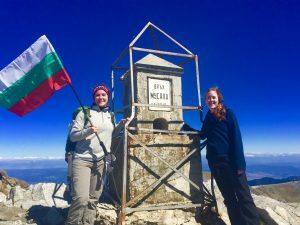 I climbed Musala, the tallest peak on the Balkan Peninsula, with fellow ETA (and fellow second year grantee) Emily Paxson. This was one of our very first weekends in Bulgaria. Why should prospective grantees apply to work in Bulgaria? Grantees who want to work in Bulgaria should know that the Bulgarian Fulbright Commission runs a fantastic program. They take great care in assigning ETA placements, matching people’s preferences and personalities to communities. 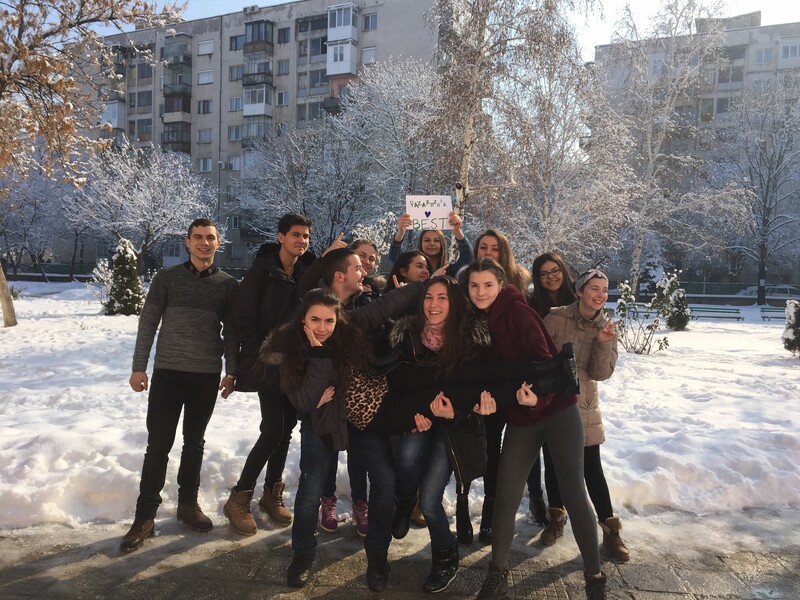 We had a ten-day orientation when we first arrived in country, which covered everything from survival Bulgarian skills to current Bulgarian politics to the basics of teaching ESL. We also have a midyear and closing conference. The U.S. Embassy is also highly supportive of our work. Bulgaria’s location makes it affordable and simple to travel to other countries on school breaks. Meeting ETAs in Austria and Georgia (the country) have been travel highlights for me. This spring I’ll be traveling to Berlin for a conference of Fulbrighters from across Europe. Living in Bulgaria, while not easy, is incredibly rewarding for open-minded people who want to challenge themselves. How have your experiences in Bulgaria changed you? I’m more sure of my desire to work in international development. I’ve seen the complicated realities of aid projects in my communities here, and I want to help design effective projects to address inequality in educational and economic opportunities. I’ve gained a different perspective on some of the topics I learned about in the classroom during college. On a personal level, I’ve learned how to prioritize my time and not worry about the little things. The pace of life here is healthier than the incessant focus on work many Americans, myself included, have. Taking the time to eat a good meal or share coffee with a friend makes me better at my job. Working across a language barrier and with teenagers has enhanced my ability to think fast and deal with stressful situations. Despite the challenges, I really enjoy life in Bulgaria. As Fulbrighters – and Americans – in a foreign country, we are cultural ambassadors 24/7. Some of my most meaningful conversations with Bulgarians have happened on the train or in a convenience store. People are curious about the U.S.! Also, as a Fulbrighter, at least in Bulgaria, people are very receptive to requests for meetings and eager to help with Fulbright projects. Most of us probably won’t have this kind of freedom from a traditional job schedule again, so it’s important to make the most of it. Anna is currently pursuing a Master’s of Public Policy at University College Dublin, studying how nonprofit organizations can work with the public and private sectors to address key social issues.